Keeping your balance and preventing a fall just got easier, thanks to Preventing Falls, from the experts at Harvard Medical School. This information-packed guide explains how your body works to keep you balanced, and the health problems, medications, and home-hazards that can set you up for a fall. And it provides specific ways to help you improve your balance and maintain your mobility. Every 11 seconds an older person in the U.S. is treated in an emergency room for a fall-related injury. But the risk factor most likely to predict a future fall is a previous fall! Chances are you don’t remember you’ve fallen unless you are injured. You might trip over the edge of a carpet … Twist an ankle as you step off a curb … Or stumble over a box in the garage. They seem like small problems, but as you’ll soon discover in Preventing Falls these are all signs you need to be more careful to prevent a serious fall. The type of yoga that is best at reducing falls. Plus, you’ll even get an at-home guide to preventing falls with 57 room-by-room tips to fix the fall hazards lurking in your home. 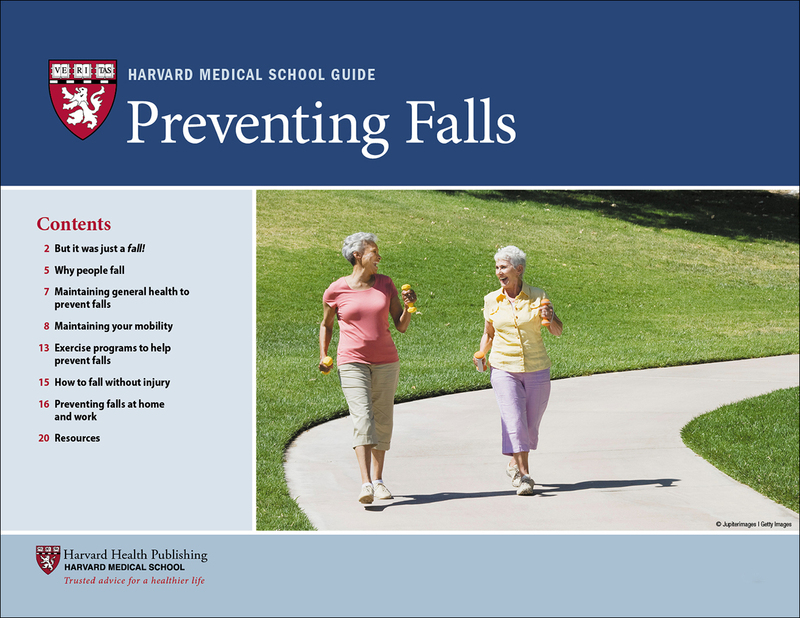 Don’t risk a serious fall when Harvard Medical School’s Preventing Falls has the answers you need for improving your balance, maintaining your mobility, and staying steady on your feet. But it was just a fall! The New York State Department of Health reports that falls are the leading cause of accident-related hospitalization for people over age 25 and the leading cause of accidental death for those over age 45. For people over age 65, falling is the single most disabling event likely to put them in a nursing home. Worldwide, falls are the second leading cause of accidental death. That’s because the risk of falling presents itself in so many aspects of daily life. Routine acts—such as getting out of bed, going to the bathroom, taking a shower, or getting in and out of a tub— can be far riskier than most people realize. While broken bones in the limbs are a very common injury from falls, hip fractures are considered the most serious types of fractures—often resulting in permanent disability and sometimes death. The risk of hip fractures increases with age. According to the Centers for Disease Control and Prevention (CDC), an estimated 300,000 people over 65 are hospitalized for hip fractures each year, and more than 95% of hip fractures occur as a result of falls. Falls are the single most significant cause of traumatic brain injury. These injuries can result from something as simple as tripping on a sidewalk or falling in the shower. They can lead to permanently impaired mental abilities and emotional instability. Brain injuries also have been linked to a higher risk of developing dementia. The initial symptoms of a traumatic brain injury may occur immediately or may be delayed for many hours after the fall. Strains (affecting the muscles) and sprains (affecting the ligaments) are among the less serious—but still painful—neck injuries that are common results of falls. A herniated disc happens when the cushion between two spinal bones is squeezed out of position, often putting pressure on a nerve as it exits the spine. These injuries can result from a sudden twist or jerk of the neck that may occur during a fall. Cervical spine fractures of the neck in younger people often result from a hard impact or long fall. Less force is needed to produce fractures in older people whose bones have begun to weaken. Cervical dislocation is another serious injury that occurs when the bones of the neck are pushed out of alignment, usually by a fracture. This type of injury requires immobilization of the neck and immediate medical care (often surgery) to prevent damage to the spinal cord. Spinal cord injury is by far the most serious of neck injuries. It usually results from a neck fracture, dislocation, or both. Spinal cord injuries in the uppermost region of the spine are generally fatal. Patients who survive usually develop paralysis of the arms and legs and may need the assistanceof a breathingmachine (respirator). Tripping or falling a short distance can cause back injuries as a result of the impact itself or excessive twisting of the spine. They may simply cause temporary back pain. But older people are more likely to suffer vertebral compression fractures, nerve compression, or damage to the spinal cord. These injuries can cause extreme pain or pressure in the neck, head, or back; tingling or numbness in the arms and legs; and difficulty with walking or balance.